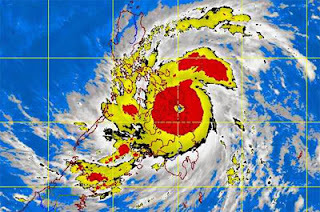 Super Typhoon Yolanda made landall in Southeast of Guiuan, Eastern Samar this early morning, Friday, November 8, state weather forecasters said. PAGASA weather bulletin as of 5 a.m. today, "Yolanda hit Guiuan with maximum sustained winds of 235 kph near the center and gustiness of up to 275 kph." PAGASA raised public storm warning signal 4 in 21 areas including Guiuan in Eastern Samar, where Yolanda made first landfall. According to PAGASA, Yolanda may cross Biliran, the northern tip of Cebu, Iloilo, Capiz, Aklan, Romblon, Semirara Island, the southern part of Mindoro then Busuanga. For the meantime, please bookmark this page now or visit this site more often for you to be updated. You may also share this post to your friends so they may know about bagyong Yolanda. Comments or suggestions about "Bagyong Yolanda Update - Super Typhoon makes landfall in Samar" is important to us, you may share it by using the comment box below.